Rating: 6.4/10. From 136 votes. Historically, the Kahr Arms line of semiautos has been, to put it bluntly, a bit pricey. 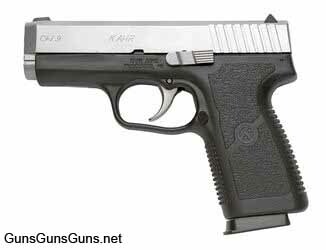 The folks at Kahr took note of this when they developed the CW9, a compact semiauto chambered in 9mm and built on a polymer frame. The CW9 is priced $254 less than its parent, the P9. The P9 carries an MSRP of $739 with two magazines, versus the CW9 at a suggested retail of $485 with one magazine (and it sells for less at most firearms dealers). When I saw the CW9 at a trade show, my first question to Kahr Arms Vice President Frank Harris was, what was sacrificed to get this lower price? Harris took me on a detailed tour of the CW9, but it wasn’t until I had a CW9 and a P9 side by side at home that I could truly appreciate what’s been done. Without getting too far into how CNC cuts were or were not changed and the advantages of increased bearing surfaces for durability, suffice to say the savings came from the Kahr Arms engineers figuring out how to spend less machine time on each gun. In this modern world of CAD-CAM and CNC, and good wages for those who work at this stuff, eliminating any amount of time results in significant cost cutting. In construction and operation, the CW9 mirrors the P9. The slide is stainless steel with a matte-stainless finish, and it’s fed from an all-steel seven-round magazine with a removable finger-rest base plate. There are some differences between parent and offspring, done to cut manufacturing costs. The CW9 has not been cheapened, though. The savings were found by a thoughtful examination of what Kahr could do to lessen cost without losing quality. The CW9 lacks the rounded edges found on my sample PM9, substituting angled but flat machine cuts to accomplish the same no-snag surfaces. For example, the muzzle features a series of inward sloping cuts to allow easy reholstering, and, rather than rounding the slide, Kahr gives the top edge an angle-flat machine cut. Also, the curved, artistic line on both sides of the slide are gone—all good examples of how small changes can affect cost but not function. In addition, the barrel is now conventionally rifled, not polygonally. The CW9 (right) has a pinned sight and angles on the slide, not a dovetailed sight and curves like the P9 (left). The low-profile, white bar-dot combat sights have been changed from metal to polymer and the front sight pinned in, not dovetailed to the slide. 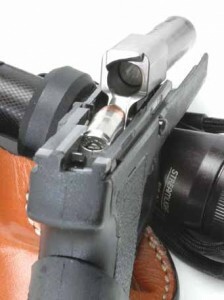 The rear sight remains dovetailed into the slide and is windage adjustable. It’s well worth noting that, while the front sight is pinned in, Kahr uses two staking pins doubly ensure the sight stays put. The CW9 also uses the more flattened slide stop, which is also used on the subcompact Kahr. For me, this is a big plus because the wider slide stop always catches on something when I carry it. The CW9 of course offers shooters the standard features found across the entire Kahr lineup. Kahr sights are fixed but windage adjustable, with Tritium night sights as an option. All magazines are steel, with witness holes in their sides. There is no external safety, but the Kahr (like the Glock system) has an internal firing pin safety. The magazine release is located at the bottom-rear of the ample and curved trigger guard that protects the curved, smooth-faced trigger. The trigger pull runs from 7–9 lbs. After picking up the CW9 from King Shooters Supply in King of Prussia, Pa., I did some range work at my club, the Lower Providence Rod and Gun Club in Oaks, Pa. My first drill: get a few rounds downrange to re-acquaint myself with the Kahr double-action-only (DAO) trigger. Then I began accuracy and reactive firing work. Now, while the Kahr is more than able to cluster hits next to each other at 50 feet from a seated rest, most users won’t take the time to carefully manipulate the DAO trigger to do so. The difficulty in doing this “trick” is in controlling trigger overtravel, because the trigger must both retract and release its striker, and therefore it must have some rearward movement afterwards. I had a so-so day. I’d manage three nice hits, and then two would slip out of the group. Regardless, the results generally came in under 3″. Kahr Arms holds patents on its offset feeding and trigger system. The CW9 did not like any of the brands of so-called green or frangible ammunition; this is curious because it’s run well in other 9mm handguns. I had three other shooters on the gun, and combined we suffered only two malfunctions. 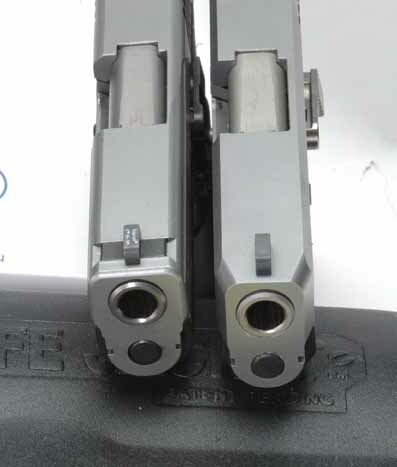 In both instances, the round failed to chamber: one when loading from slide lock, and the other when loading with the slide forward. Both times, the subject cartridge was successfully re-chambered in the same manner. Also worth noting: I brought along a P9 and a PK9 (subcompact) in addition to the CW9, and both worked well with all of the above ammunition, with no malfunctions. With the CW9, Kahr Arms has well addressed the most often voiced complaint about its pistols—they cost too much. No one said you didn’t get value for your money, just that they didn’t want to spend that much. With the CW9s modifications, now they don’t have to! This entry was posted in $251-$500, $501-$750, 9mm, Compact, Kahr Arms, Semiauto and tagged Handgun Reviews on April 12, 2012 by Walt Rauch. I had hoped that purchasing a CW9 would be the end all to my CCW search. Not so much; Negatives: poor accuracy, ammo finiky, guide rod issues. Positives: love the size, flatness, weight, trigger pull, not bad recoil with standard pressure ammo. Moved on the a KelTec PF9 – I’d give it a 6 start rating. I may try the new LC9 once the prices settle down. I have fired a box of shells through it and only one FTF issue where I was able to eject the shell and then fire the same bullet later without problems. The gun is very accurate and fun to shoot! Tried other nines that I didn’t like and I like the Kahr better than my CZ 75B 40 cal in satin nickel. I’ve had my CW9 for several months now as my off-duty weapon. It carries well in a IWB holster. It’s had over 300 rounds through it, and even through the break-in period it functioned flawlessly. It is pleasant to shoot, with a fine trigger pull and managable recoil, and it is quite accurate. The CW-9 is a pistol I can recommend without reservation. This is an excellent CCW piece. I ran 250 rounds of various 115gr FMJ for break-in without a single malfunction. Paid $339 at a LGS and got an extra free magazine from Kahr during a special promotion. Very accurate, mild recoil and excellent quality in an AMERICAN made firearm. Have been carrying my CW9 now for 3 years, have fired well over 1,000 rounds of mostly Winchester white box ammo, although I carry it with Speer Gold Dot 115 grain. For me the gun is a perfect size for concealed carry and it handles nice. it has been very reliable with only 1 jam within the first 50 rounds. no jams since. I am very satisfied except for one issue, and that is accuracy. For a 5 yard defense gun its good, but extend the range and it doesn’t group very well. In reading the other comments I may try some Remington Golden Sabre ammo. If I could find something about the same but with better accuracy, I would change! In the meantime I will keep trying other brands of ammo! I really enjoy mine. It is very comfortable when carried in a Gould & Goodrich IWB holster. Reliability is excellent, but the little pistol is finicky regarding ammo. My particular weapon runs best when used with Gold Dot. I have had only one malfunction in five hundred or so rounds (stove pipe). Accuracy is very good for a short barreled, light weight hand gun. I can keep all eight rounds in the ten ring at fifteen yards in rapid fire, unsupported drills. Buy it! I have the cw9 & cw45. will the 9 handle +P ammo? good product, enjoy shooting. 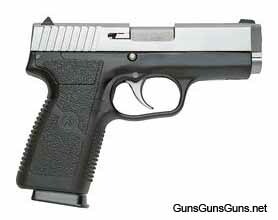 WE have purchased a few of the kahr hand guns. Nothing good to say. We use them as [paper weights and loan them to possible folks that we know that are looking at the weapon. Would not recommend any kahr weapons.